Atar Arad was born in Tel Aviv, where he began his early musical education and violin studies. In 1968 he was one of a few young artists to be selected to study in the renowned Chapelle Musicale Reine Elisabeth under the patronage of the Queen of Belgium. In 1971, drawn by the deep, warm sound of the viola and its broad but unfamiliar repertoire, he decided to devote himself to this instrument and its music. The following year, in July 1972, in his first appearance as a violist, he won the City of London Prize as a laureate of the Carl Flesch Competition for violin and viola. Two months later he was awarded the First Prize at the International Viola Competition in Geneva by a unanimous decision of the jury. Numerous concerts followed — as soloist with major orchestras, and in recitals at some of Europe’s most prestigious festivals. Arad’s recordings for Telefunken are widely acclaimed. His Sonata per la Grand’ Viola e Orchestra by Paganini was considered by stringed-instrument lovers and critics alike to be an astonishing demonstration of the technical capabilities of the viola. His album in collaboration with pianist Evelyne Brancart, was praised by High Fidelity Magazine as being “…perhaps the best-played viola recital ever recorded”. In 1980 Arad moved from London to the U.S. in order to become a member of the Cleveland Quartet for the next seven years. With this great Quartet he toured throughout the U.S., South America, Western and Eastern Europe, Israel and Japan, collaborating with many leading musicians (such as pianists Istomin, Curzon, Pressler and Ax, violists Schidloff and Laredo, Cellists Ma and Rostropovich, flutist Gallway and clarinetist Stolzmann to name a few), recording for labels such as RCA, CBS and Telarc, and appearing in music festivals including Aspen, Berlin, Edinburgh, Flanders, Israel, New York Mostly Mozart and Carnegie Hall, Paris, Salzburg, and many more. During that time he held the position of a Professor of Viola at the Eastman School of Music. Arad was an artist/faculty member at the Aspen School and Festival. He also taught at the Shepherd School of Music at Rice University in Houston, TX, and was an artist/lecturer at Carnegie Mellon University in Pittsburgh. 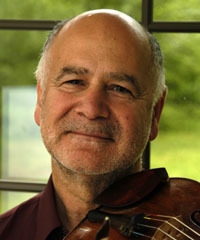 He currently serves as Professor of Music (viola) at the Jacobs School of Music, Indiana University, Bloomington, and in the summers he also teaches at the Steans Music Institute (Ravinia Festival) in Chicago, Domaine Forget Academy of the Art, Heifetz Institute and in Keshet Eilon Music Center, Israel. Arad served as a regular guest artist in a great number of musical venues, such as Houston’s Da Camera Society, Seattle Chamber Music Festival, the Upper Galilee Chamber Music Days (Israel), the Norfolk Chamber Music Festival, Chamber Music International in Dallas, Sitka Festival, Chautauqua Festival, Ravinia Music Festival, Orford, Domaine Forget, Banff and Chicago’s North Shore Festival. A frequent guest with today’s leading chamber ensembles, Arad has performed, among others, with the Guarneri, Emersson, Tokyo, Mendelssohn, American, Chillingrian, Vermeer, New Zealand, Orion, and more recently with Pacifica and Verona string quartets. A late-bloomer composer, Arad wrote his first musical composition – a Solo Sonata for Viola in 1992. The Sonata was premiered in 1993 as part of Arad’s recital at the Viola Congress in Chicago and was published by the Israel Music Institute (1995). His student, violist Roland Glassl, the winner of 1997 Tertis International Competition gave the London premier of the Sonata in 1998 at the Wigmore Hall. In 1998 Arad completed his first string quartet, premiered in Bloomington on April 1999 by the Corigliano Quartet. His Quartet No.2 (2016) was premiered by the Verona Quartet. He premiered his own Viola Concerto (2005) in Bloomington, Brussels and Stockholm with conductors Uriel Segal, Ronald Zollman and Michael Bartosz, respectively. Other Compositions Include Toccatina A La Turk for two violins and “GDG(! )” for string trio (both dedicated to Mimi Zweig and her Violin Virtuosi), Esther for Violin and Viola, Tikvah for Viola Solo, commissioned by the ARD for the 2008 Munich Viola Competition. “Listen (Three Poems by W.S. Merwin)” for Tenor, Clarinet, Viola, Cello and Double Bass was commissioned by the International Musicians Seminar and performed in September 2010 on its concert tour, including London’s Wigmore Hall, with tenor Mark Padmore. Cellist Gary Hoffman premiered Epitaph for Cello and String Orchestra in 2011 Kronberg Cello Festival and Arad gave the viola version of the piece at the 2012 International Viola Congress in Rochester, NY. In 2013 Arad Completed a set of Twelve Caprices, the first six of which he performed at the 2004 Viola Congress in Minnesota along with the rarely played Tibor Serly’s Viola Concerto. Later, in 2015-16, he toured extensively with the set as a whole in Tel Aviv, Boston, Chicago, Toronto, Berlin, Frankfurt, Detmold, Hamburg, Paris, Madrid, Porto, London, Manchester and Birmingham. The Twelve Caprices along with his Tikvah are now published by Hofmeister Musikverlag, Leipzig, and can be heard on iTunes and CD Baby. Atar Arad plays on a viola by Niccolo Amati (the ‘Arad’) and uses a set of PI strings, made by Thomastik.